La Asociación de Derecho Administrativo de la Ciudad Autónoma de Buenos Aires (www.adaciudad.org.ar) realizara su 4º Congreso de Derecho Administrativo de la Ciudad Autónoma de Buenos Aires bajo la temática “Los derechos humanos desde los regímenes locales”. 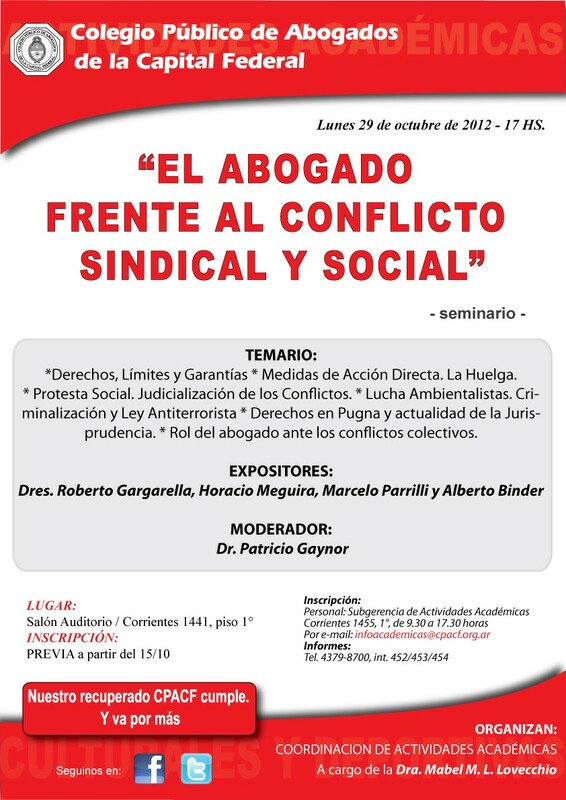 Organizado conjuntamente con el Colegio Público de Abogados de la Capital Federal, se llevará a cabo los días 1 y 2 de noviembre de 2012 en la sede del Colegio, sita en Corrientes 1441 piso 1º. La actividad consistirá en un encuentro de distintas jurisdicciones donde profesionales de diversas disciplinas expondrán, debatirán y elaborarán propuestas sobre temas que hacen al derecho de cada régimen local, aunque con una perspectiva común: su abordaje a partir de los derechos humanos involucrados. El evento reunirá a magistrados, funcionarios del Gobierno porteño, académicos, representantes de la actividad privada, integrantes de organizaciones no gubernamentales y otros expertos en la materia que aportarán sus distintos puntos de vista en aras a enriquecer el debate en comisiones que animarán los participantes. Asimismo, aprovecharemos la oportunidad para homenajear a la Dra. Aída Kemelmajer de Carlucci, quien además será declarada socia honoraria de la asociación. Expondrán entre otros: Roberto Gargarella, Agustín Gordillo, Alejandro Pérez Hualde, Carlos Balbín, Ernesto Bustelo, , Dante Rusconi, Ariel Caplán, Gustavo Maurino, Carlos Botassi, Inés D´Argenio, Juan Justo, Dalmiro Garay, Luis Arias, Paulo Friguglietti, Raquel Alianak, Luis Arias, Martín Liber, Lucía Burundarena, Arístides Corti, Sebastián Tedeschi, Marcos Rebasa, entre otros. Talleres de trabajo en comisiones de acceso libre y gratuito funcionarán el día 2 de noviembre de 10 a 12.30 horas. en el Edificio Anexo del CPACF. Recién hoy pude leer el interesante informe de la ADC sobre el modo calamitoso en que se organiza (...) la prisión preventiva en la Argentina. La principal virtud del informe, en mi opinión, tiene que ver con el tema que me llevó a abordarlo: el especial (y fuera de lo común) foco que han puesto en la situación de los familiares de los detenidos con prisión preventiva. vivíamos y mudarme a la casa de mi mamá. quedan las secuelas. Tenés que dedicarte”. In this essay I shall briefly review the history of Latin American constitutionalism (1810-2010). My major interest is to study two of the main features of the region’s Constitutions, namely their exceptional commitment to social, economic and cultural rights; and their obstinate insistence with concentrated models of political organization. My work is divided into three parts. The first one refers to the “founding period” of Latin American constitutionalism; the second examines the period of “social constitutionalism” that emerged in the first part of the 20th Century; and the third one studies the last wave of constitutional reforms that began at the end of the 20th Century. Most Latin American countries entered the 20th Century with liberal-conservative Constitutions, this is to say Constitutions that were the result of a political compact between liberals and conservatives. Most of these agreements were signed in the second half of the 19th Century, a time when liberalism and conservatism represented the two main political forces in the region. Their constitutional compact, however, was unexpected, given that the two groups appeared as fierce political enemies during the first half of the Century. The fact is that after years of severe disputes, the two rival political factions began to join forces and forge an alliance that would remain intact during decades. The Constitutions that liberals and conservatives created during those years appeared as an imperfect synthesis of the legal aspirations of the two groups. More specifically, these new Constitutions reflected, on the one hand, the commitment to a system of checks and balances and State neutrality (mainly, religious tolerance), which characterized the aspirations of the liberal group; and the commitment to a system of concentrated authority, regional centralization and moral perfectionism, which characterized the aspirations of the conservative group. The new Constitutions, one could claim, represented a combination between the U.S. Constitution, which was at the time very influential among liberals, and the 1833 Chilean Constitution, which represented the most influential conservative Constitution during the 19th Century. In addition, the liberal-conservative Constitutions rejected the incorporation of either social clauses in favor of the disadvantaged, or political initiatives favoring mass participation in the public sphere. This is to say, the liberal-conservative compact was also an exclusionary compact, which implied the displacement of most of the institutional initiatives that radicals groups –frequently inspired by Anglo-American radicals and the example of the French Revolution- then proposed. During all those years, in fact, radical groups had advanced numerous constitutional proposals, which included annual elections; the right to recall; mandatory rotation; mandatory instructions; etc. In addition, radical groups had promoted different reforms aimed at addressing the “social question”. However, the triumph of the liberal-conservative project implied the rebuff of all those initiatives. The liberal-conservative constitutional compact was enormously successful in the establishment of regimes of “order and progress”. This was particularly so since the 1880s, when most countries in the region began to massively export primary goods, and Latin America enjoyed an exceptional period of economic prosperity and political stability. The first and extremely radical sign of alarm appeared with the 1910 Mexican Revolution. The Revolution, as we know, had a quite spectacular constitutional outcome, namely the 1917 Constitution. This Constitution was exceptionally long, robust in its declaration of rights, and strongly committed to social rights, which was at the time a complete novelty. In fact, the Mexican Constitution became pioneer in the entire world in the development of social constitutionalism. It accompanied the enactment of the Constitution of the Republic of Weimar, in 1919; the creation of the International Labor Organization (ILO, 1919); and the development of the Welfare State and the Keynesian economic model. Among many other clauses, the Mexican Constitution included article 27, which declared that the ownership of the lands and waters within the boundaries of the national territory were “vested originally in the Nation”; and also article 123, which incorporated wide protections for workers and recognized the role of trade unions; regulated labor relations reaching very detailed issues, which in a way covered most of the topics that later on would come to distinguish modern Labor Law. This clause made reference, for example, to the maximum duration of work; the use of labor of minors; the rights of pregnant women; the minimum wage; the right to vacation; the right to equal wages; comfortable and hygienic conditions of labor; labor accidents; the right to strike and lockout; arbitrations; dismissals without cause; social security; right to association; etc. The 1917 Mexican Constitution decisively changed the history of Latin American constitutionalism. Since its adoption, and little by little, most countries in the region began to change their basic constitutional structure. In fact, and following Mexico’s early example, most countries began to include long list of social rights in their Constitutions: Brazil modified its Constitution in 1937; Bolivia in 1938; Cuba in 1940; Uruguay 1942; Ecuador and Guatemala in 1945; Argentina and Costa Rica in 1949. This was the way in which Latin American Constitutions expressed, through the use of the legal language, the main social change that had taken place in the region during the first half of the 20th Century, namely the incorporation of the working class as a decisive political and economic actor. After this first wave of reforms, the region recognized a second period of constitutional changes, which was fundamentally concentrated between the end of the 1980s and 2000. In this new epoch, Brazil changed its Constitution in 1988; Colombia in 1991; Argentina in 1994; Venezuela in 1999; Ecuador in 2008; Bolivia in 2009; and Mexico in 2011. Most of these new legal documents were impacted, in one way or another, by two grim events. The first event was political, and was the emergence of a new wave of dictatorships that affected the region (notably, since the military coup against Salvador Allende, in Chile, 1973). The second event was economical, namely the adoption of neoliberal reforms and programs of economic adjustment, by the end of the 1980s. The period of military governments had a profound effect in the region, at different levels. First of all, it obliged some countries, after the recovery of democracy, to substantively reconstruct their constitutional organization. This was, for example, the case of Chile, as a consequence of the numerous authoritarian enclaves left by General Pinochet’s 1980 Constitution. And this was also the case of Brazil, which had to confront the 1967 Constitution, enacted during the military government of General Humberto Castelo Branco. Among other things, the 1967 Constitution (amended in 1969), imposed severe limitations on the federal organization of the country and the political and civil liberties of the population. In addition, the end of this ruthless era of dictatorships came together with other rights-based constitutional reforms. These changes implied giving special, sometimes constitutional status, to different human rights treaties that the countries had signed during the last four or five decades. These treaties were designed to protect the same basic human rights that had been systematically violated by dictatorial governments (Sikkink 2012, Acuña & Smulovitz 1996). Argentina, Brazil, Bolivia, Colombia, Costa Rica, Chile, and El Salvador were among the many countries that tried to ensure more protections for the rights affected by the recent authoritarian governments. The decision to provide a special legal status to diverse human rights treaties created interesting results. In part, these initiatives expressed the reconciliation of certain parts of the political left with the issue of rights and constitutionalism, which they had frequently resisted. In addition, the new legal status many of these Constitutions granted to human rights had an interesting effect on conservatives. For instance, after these constitutional changes, many conservative judges began to consider more seriously arguments based on the value of human rights. The other fundamental constitutional change produced in the region, by the end of the 20th Century, came as a consequence of the application of so-called programs of structural adjustment. By structural adjustment programs, we mean the harsh economic policies applied in the region during the 1980s, usually by democratic, post-dictatorial governments. These were monetary policies that usually implied a drastic reduction of public expenditures and the elimination of social programs. These adjustment programs were originally promoted in Great Britain under the direction of Margaret Thatcher and in the United States during the Presidency of Ronald Reagan (Etchmendy 2011; Cavarozzi et al 2002; Svampa 2005). The impact of these policies of structural adjustment on constitutionalism was enormous. More directly, the launch of these programs usually required the introduction of legal and even constitutional changes directed at facilitating the application of economic initiatives. Also -and more significant for our present purposes- the economic changes of the era provoked an economic and social crisis that pushed for the introduction of new legal reforms. In effect, the neoliberal programs provoked social distress and growing levels of unemployment that were not compensated by the existence of a solid safety net. As a consequence, millions of people suddenly found themselves in a situation of complete abandonment, without means to ensure their own subsistence and the subsistence of their family. The State, which for the previous 40 years had guaranteed work and social protections for vast sectors of the population, was now shrinking. Most of its most valuable assets were sold in non-transparent and hasty transactions. As a consequence, Latin America began to experience a process of social mobilization demanding the social protections that many Constitutions still promised. Social protests and counter-institutional uprisings exploded in the entire region, from South to the North, East to West. They included, for example, the insurrection of the Zapatistas of the EZLN in Mexico (which began in January 1994, one year after Mexico's signature of its free trade agreement with the United States); but also the "wars" of "water" (2000) and "gas" (2003) in Bolivia, directed against the privatization of basic sections of the national economy; the occupations of land promoted by the Landless Movement (MST) in Brazil; the taking of lands in Santiago de Chile; the "invasions" of property in Lima, Peru; the emergence of the piqueteros movement in Argentina; and also numerous acts of violence against the exploitation of mineral resources in different parts of the region. Not surprisingly, some of the most relevant socio-legal reforms of the last few decades -including those of Colombia, Bolivia, Ecuador, Venezuela and Mexico- followed the economic crises of the 1990s. 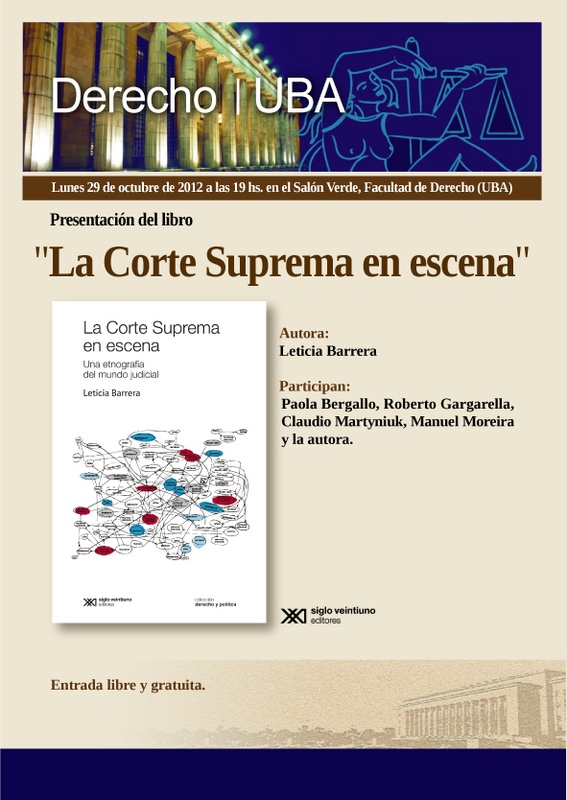 The new constitutional changes can be read as a direct response to the social crisis of the previous years. Thus, by the end of the Century, most countries in the region had adopted extremely strong Constitutions, at least with regards to the social, economic and cultural rights that they included. A first look at the prevalent organization of these Constitutions’ bill of rights allows us to recognize the dimension of this phenomenon. According to a recent study, present Latin American Constitutions guarantee the protection of the environment, culture; health; education; food; housing; work; clothing; etc. (Gargarella, Filippini & Cavana, 2011). In addition, some of the new or reformed Constitutions included guarantees for gender equality; incorporated mechanisms of participatory democracy; created the institution of referendum or popular consultation; introduced the right to recall; or recognized the right to affirmative action. Still more notably, many of the renewed constitutional documents affirmed the existence of a pluri- or multi-cultural state or national identity; provided special protection to indigenous groups; and established the duty to mandatory consultation to indigenous communities, before the development of economic projects that could affect their communal organization. Examples as the ones that we revised in the previous pages make us clear how important, but also how limited, it was the task of those who got involved in processes of constitutional reform. Legal reforms could not or did not want to go as far as they could have gone, in order to ensure that those reforms had the transformative character that they (so declared) wanted them to have. To state this does not deny the value of what has been achieved in the region, in constitutional terms, in recent years. Many of these reform processes managed to advance the interests of the most disadvantaged at least in the books. Better than that, the practice of these Constitutions showed that the changes introduced in the section of rights were far from innocuous. In the last few years (although –and this is a problem- only in the last few years), the Latin American countries that had adopted more socially robust Constitutions developed an interesting and imaginative practice of judicial enforcement of social rights (Cepeda 2004; Gargarella et al 2006; Gauri & Brinks 2008¿ Wilson 2005). However, it seems also clear that these reforms were, in the best case, very limited in their scope and achievements. And one of the main reasons that explain this conclusion is the fact that the reformers seemed to have concentrated their energies in the section of rights, without taking into account the impact that the organization of power tends to have upon those very rights that were then (extra) protected. Notably, legal reformers dedicated most of their work to the creation of new rights, leaving the organization of powers basically untouched. By acting in this way, legal reforms maintained the doors of the “engine room" of the Constitution closed: the core of the democratic machinery was not changed, the engine of the Constitution did not become the main object of their attention, as if their mission concluded with their work on the rights- section; as if the main controls could only be touched by the closest allies of those in power. It is interesting to contrast this remarkable omission, typical of recent reformers, with what their old intercessors used to do, when engaged in a process of constitutional change. For example, the engineers of the liberal-conservative compact showed no doubts about what they were required to do, in order to ensure the life of their most cherished rights -say, basically, the right to property. For them, it seemed totally clear that in order to guarantee protections to, say, the right to property, the first thing to do was to get into the "engine room" and introduce some necessary modifications first. Typically, then, they proposed the restriction of political liberties in order to ensure the enjoyment of broader economic freedoms. This was, for example, Juan B. Alberdi's main constitutional lesson for his time: it was necessary to temporarily tie the hands of the majority, so as to ensure protection for certain basic economic rights (Alberdi 1920). The “mistake” of recent reformers also contrasts with what old radicals used to do, when engaged in processes of constitutional change. Radicals concentrated all their energies in producing certain basic political and economic changes (typically, an agrarian reform; a government by assemblies) through the political mobilization of the masses. In so doing, they never subscribed the (conservative) model of concentrated authority (as contemporary radicals tend to do), and they never spoke the liberal language or rights (as contemporary radicals usually do). Of course, the problem with the new Constitutions is not simply that they did not go far enough, so as to reach the “engine room” of the Constitution –if that were the problem, the solution could have simply been to wait until the next reform. The problem is that, by preserving an organization of powers that is still arranged under the 19th Century model of concentrated authority, the new Constitutions put at risk the same initiatives that they advance through the rights-section of the Constitution (Nino 1996, 1997). Thus organized, the new Constitutions tend to present a contradictory design: they look democratic and socially committed in their section of rights, while at the same time they seem to reject those same social-democratic ideals through their traditionally vertical political organization. Not surprisingly, and as a consequence, the old hyper-presidentialist political organization has tended to block all the initiatives directed at setting in motion the initiatives for popular empowerment included in the new Constitutions. For example, Argentina’s political authorities refused to implement the participatory clauses incorporated in the 1994 Constitution; Ecuador’s President systematically vetoed all the initiatives directed at enforcing the newly created mechanisms for popular participation; in Peru, Chile, Mexico or Ecuador, indigenous leaders suffered prison or repression every time they wanted to put in practice their newly acquired rights. The Constitutional reform of 1949 was not properly conducive to the predominance of the people, by favoring the exercise of political power by the popular sectors. This was due, first, to the faith that the triumphant popular sectors had in the charismatic leadership of Perón. Secondly, this was due to the same vigilant attitude of Peròn, who made everything possible to prevent the popular sectors to achieve an actual power that could impair the power of the legal government. These facts helped the government to stay in power until the time that the oligarchical sectors, in accordance with the armed forces, decided to put an end to his government. That was, then the Achilles heal of the reform. And this explains why the Constitution died, like Achilles, died at an early stage, by his enemy: it was vulnerable precisely in the most significant part, this is to say in that part that had to provide for its support (Sampay 1973, 122). With unusual virtue, Sampay recognized the fatal mistake that he and other members of his generation committed, by not paying sufficient attention to what he himself described as the Achilles heal of the Constitution. Social reformers like Sampay should learn from him that important lesson. The new Constitutions need to make consistent the organization of powers with the new social impulses that they incorporated through the Bill of Rights- section of the document. In other words, in order to introduce social changes in the Constitution, one needs to primarily affect an organization of power that was designed for old, elitist, 19th Century societies. Acuña, C. & Smulovitz, C. (1996), "Adjusting the Armed Forces to Democracy. Successes, Failures and Ambiguities in the Southern Cone," in E. Jelin & E. Herschberg, Constructing Democracy. Human Rights, Citizenship and Society in Latin America, Boulder, Colorado. Alberdi, J. B. (1920), Obras Selectas,Ed. Joaquín V. González, Buenos Aires: La Facultad. Cavarozzi, M., & Abal Medina, J. (2002), comps., El asedio a la política. Los partidos latinoamericanos en la era neoliberal, Rosario: Homo Sapiens. Cepeda, M. (2004), “Judicial Activism in a Violent Context: The Origin, Role, and Impact of the Colombian Constituional Court, 3 Washington University Global Studies Law Review 259. Etchemendy, S. (2011), Models of Economic Liberalization: Business, Workers, and Compensation in Latin America, Spain, and Portugal, Cambridge: Cambridge University Press. 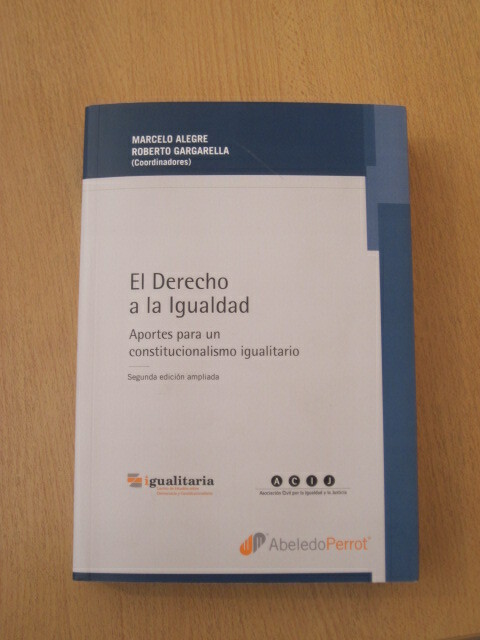 Gargarella, R. (2010), The Legal Foundations of Inequality. Constitutionalism in the Americas (1776-1860), Cambridge: Cambridge University Press. Gargarella, R. (2013), The “Engine Room” of the Constitution. 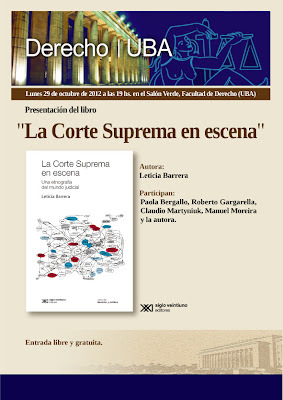 200 Years of Constitutionalism in Latin America, Oxford: Oxford University Press (forthcoming). Gargarella, R.; Domingo, P; Roux, T. (2006), Courts and Social Transformation in New Democracies, London: Ashgate. Gargarella R., Filippini L., Cavana, A. (2011), Recientes reformas constitucionales en América Latina, Reporte UNDP. Gauri, V. & Brinks, D. (2008), Courting Social Justice, Cambridge: Cambridge University Press. Nino, C. (1996), “Hyperpresidentialism and Constitutional Reform in Argentina,” in A. Liphart and C. Waisman, eds., Institutional Design in New Democracies, New York: Westview Press. Nino, C. (1997), The Constitution of Deliberative Democracy, New Haven: Yale University Press. Pisarello, G. (2011), Un largo termidor. Historia y crítica del constitucionalismo antidemocrático, Quito: Corte Constitucional del Ecuador. Sampay, A. (1973), Constitución y pueblo, Buenos Aires: Cuenca Ediciones. Sikkink, K. (2012), The Justice Cascade. How Human Rights Prosecutions are Changing World Politics, New York: Norton & Company. Svampa, M. (2005), La Sociedad Excluyente. La Argentina Bajo El Signo del Neoliberalismo, Madrid: Taurus. Wilson, B. (2005), “Changing Dynamics: The Political Impact of Costa Rica’s Constitutional Court,” en R. Sieder et al, eds., The Judicialization of Politics in Latin America, New York: Palgrave, 47-66. We may recall, in this respect, the brutal way in which Chilean conservatives treated their opponents, since the beginning of the Conservative Republic, in 1833; the bloody confrontations between unitarios and federales, in Argentina; the Federal War in Venezuela, which also divided liberals and conservatives; the cruel confrontation between the two groups in Colombia, which included episodes of Civil War; the battle of the Mexican liberals puros, in Mexico, against the forces of the conservative Santanistas. I reviewed some of these events in Gargarella (2010). Thus, by the mid-19th Century, we begin to see liberals and conservatives coming together, politically speaking. Among many other examples we find the 1853 Constitution in Argentina, the Mexican Constitution of 1857 and also the 1886 Constitution in Colombia, which were written by representatives of both the liberal and conservative groups. Another interesting case of convergence between these two forces appears in the liberal-conservative “fusion” in Chile (1857-1873); and there are other similar examples in Venezuela and Peru. Most of the new Constitutions resisted the conservative pressures in favor of establishing a particular religion, and replaced that requirement for some alternative formula. On some occasions, like in Argentina, the liberal-conservative Constitution reserved a special place for the dominant, Catholic faith (art. 2 of the Constitution, which ambiguously maintained that the State “supports” the Catholic religion), while at the same time affirming religious tolerance (art. 14). In other occasions, like in Mexico 1857 (or, similarly, in Ecuador 1906), the Constitution remained silent on the subject, which was a way of affirming the impossibility of either group to consecrate its own viewpoint on the subject. In Chile, the strongly religious profile of the 1833 Constitution was moderated after some decades, when an interpretative law (from 1865) opened room for (relative) religious tolerance. Most of the liberal-conservative Constitutions favored the traditional system of division of power, accompanied by a system of checks and balances, in line with the U.S. constitutional model. However, and as a consequence of the conservatives’ pressure, the new Latin American Constitutions introduced some significant changes with regard to the U.S.’s inspiring example. Typically, they created a too powerful Executive power, which challenged the structure of equilibriums that characterized the traditional system of checks and balances. The liberal-conservative Constitutions emerged after a violent period of disputes between centralist and federalist groups. This is why, in most cases, these Constitutions did not want to consecrate either a purely centralist or federalist territorial organization of the country. What they tended to do, instead, was to adopt mixed or more ambiguous solutions in this respect. Those enclaves included the institutions of life-tenured senators (which allowed Pinochet to be part of the Senate during the democratic period) and of "designated Senators" (which allowed members of the coercive forces to be part of the Senate); a National Security Congress; an extremely exclusionary electoral system (which made it very difficult for minoritarian forces to participate in electoral politics); and the requirement of qualified majorities in order to change basic aspects of the institutional system (for example, education, the organization of Congress, or the regulation of the Army). Large meetings were subject to previous governmental authorization; political parties were restricted (only the official party, namely the National Renovating Alliance -ARENA- and an opposition party, the Brazilian Democratic Movement, MDB, were allowed to function as such); direct suffrage was directly suppressed in the main cities for security reasons. In 1969, a provisional military junta introduced a profound amendment of the Constitution, which strengthened the repressive character of the previous document. It for example introduced the institution of death penalty; suppressed habeas corpus; created new military courts; and opened the door to new repressive laws, such as the Law of National Security, or another that came to regulate the press. In this respect we can mention, for example, to the 35 amendments to the 1988 Brazilian Constitution that were promoted by former president Fernando Henrique Cardoso (amendments that came to facilitate the privatization process); the reform of Article 58 in the Colombian Constitution of 1991 (which was promoted by the conservative government of Andrés Pastrana, in order to provide more guarantees to foreign investment); the modification of Article 27 of the Mexican Constitution (which came to put limits to initiatives for the distribution of land); the Peruvian constitutional reform in 1993 (which was advanced by President Fujimori -after his auto-golpe- and directed at eliminating many of the social commitments assumed by the 1979 Constitution); and the guarantees given to the value of the money in Argentina through the constitutional reform elaborated by Carlos Menem (Pisarello 2011, 186-7). Similarly, one could mention the many different initiatives for judicial reform promoted by the World Bank and other financial multilateral institutions during the 80’s, which were mainly directed at providing a more stable framework to the new types of economic transactions that dominated the period (Domingo & Sieder 2011). No podés ser tan servil al poder!